Politics & Prose Bookstore recently published the debut issue of District Lines, an anthology of original local work by writers from in and around the Washington, D.C. area. The anthology is a valuable addition to the literature of the metro area, and several contributors are long-time members and friends of The Writer’s Center. We recently asked Susan Coll, a member of the editorial staff, about the anthology, and we’re glad to post her comments here. Susan also sent us a link to video from the publication reading at P& P, and to submission guidelines for writers who'd like to submit work for Volume 2. Does the anthology fill a void in the DC literary scene? In some sense there will always be some sort of void in an arts or literary scene. But judging by the enthusiastic response we’ve had so far, and the number of submissions we had for the last Volume and now Volume 2, there are a lot of talented writers in this area and not enough outlets for them to publish. How did the fact that you are a brick-and-mortar bookstore inform the way you edited? We wanted this to be an anthology of local writing and to be more inclusive than not—we saw this less as an attempt to be Granta or The Paris Review than to be a community-building endeavor. We wanted to encourage both veteran and novice writers to think about the communities in which they live and work. That said, we did look for work that hit the sweet spot of being on topic and well written, and because we received so many submissions, we had to be somewhat selective. How did the anthology help build or reinforce the P & P community? Were there outliers in the community that the anthology helped to bring into the fold? I think it really turned out to be more of a community builder than I would have expected. For one thing we had submissions from all over the metropolitan region. One woman wrote her essay at a senior center in Annapolis and came into DC for the event. We also had someone write about the experience of being a Chinese immigrant in Centerville, Virginia. We also had great attendance at the event itself. People hung around and mingled for a long time to chat about writing and living in the DC area, so it really did feel like a great community event in that sense, as well. Did you have any expectations about what rough percent of submissions would be poems, fiction, and nonfiction, and were you surprised by the mix of submissions, by genre. We had no expectations whatsoever---we weren’t sure we’d get any submissions, so it was a nice surprise to get a nearly perfect blend of poetry, fiction, and essays. We’d love more graphics, next time. How did you get the word out to attract submissions? We put the word out through our own email list, which reaches nearly 30,000 people, and also via social media. I also asked friends, including friends at The Writer’s Center, to help spread the word. It was amazing to see how far afield submissions came from—many submissions came from around the country from people who used to live in D.C. and have since moved away. Were there particular surprises, or new things you learned about the Washington area as a result of the submissions? Yes! There was a great essay about a period during the 1960s when people thought the Capital Beltway was actually speaking to them; evidently this story did the 1960s equivalent of going viral. There was also a lovely essay by Faye Moskowitz about Cleveland Park that taught me things about the history of my own neighborhood. And someone whose husband had worked as the plumber at the White House from the Truman through the Carter administrations had some great anecdotes. 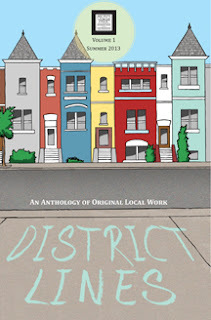 Do you anticipate having more District Lines anthologies, and if so, roughly how often? We are hoping to publish twice a year. We hope to put out our next Volume sometime this winter. How do you see the Opus printer influencing literature in the DC area? Opus provides a unique opportunity for local writers to publish independently. We’ve had authors use Opus for all manner of publications—everything from poetry anthologies and short story collections to personal narratives, memoirs, and even textbooks. We’ve had events at the store where Opus-published authors can read their own work, which we think brings together a community of writers who aren’t published elsewhere. Of course, Opus was also instrumental in enabling us to put together and produce District Lines. I’m not sure we would have done it if we hadn’t had ready access to the machine; it made the whole process easy and affordable. The Writer’s Center has received funding from The National Endowment for the Arts to offer a tuition-free writing workshop starting September 23. The workshop, which is offered to military veterans, service members and their families, meets at Hill Center, 921 Pennsylvania Avenue, SE, in Washington, D.C., two short blocks from the Eastern Market Metro station on the orange and blue line. To register please email laura.spencer@writer.org and put “Free Workshop for Military” in the subject line. We’d like to thank the NEA for funding this workshop and Hill Center for generously providing a room. A tuition-free nonfiction workshop, also funded by the NEA, will be offered at The Writer’s Center in 2014. This fiction workshop is offered to military veterans, service members, and their adult family members. It focuses on intensive writing and revision, with some required reading. Participants will submit short stories or novel chapters to the instructor and to their peers for critique. Typically, one or two stories or chapters are submitted during a workshop. Workshop participants will also submit detailed critiques of their fellow students' writing. The workshop is provided at no cost to the participants. Readings and some directed writing projects will be assigned by the instructor. Maximum attendance: 12. Workshop Leader: Ron Capps, founder and director of the Veterans Writing Project, served 25 years in the Army and Army Reserve and is a combat veteran of Afghanistan. He is a contributor to Time Magazine’s Battleland blog and to Foreign Policy; his literary writing has been featured in JMWW, The New York Times, Little Patuxent Review, Prime Number, and Riverlit. The Washington Post called his 2009 essay Back From the Brink, “stunningly good.” His essay The French Lieutenant’s iPod won first prize for creative non-fiction in Press 53′s 2011 Open Awards competition, and his 2011 essay Yellow was listed as a Notable in Best American Essays of 2012. 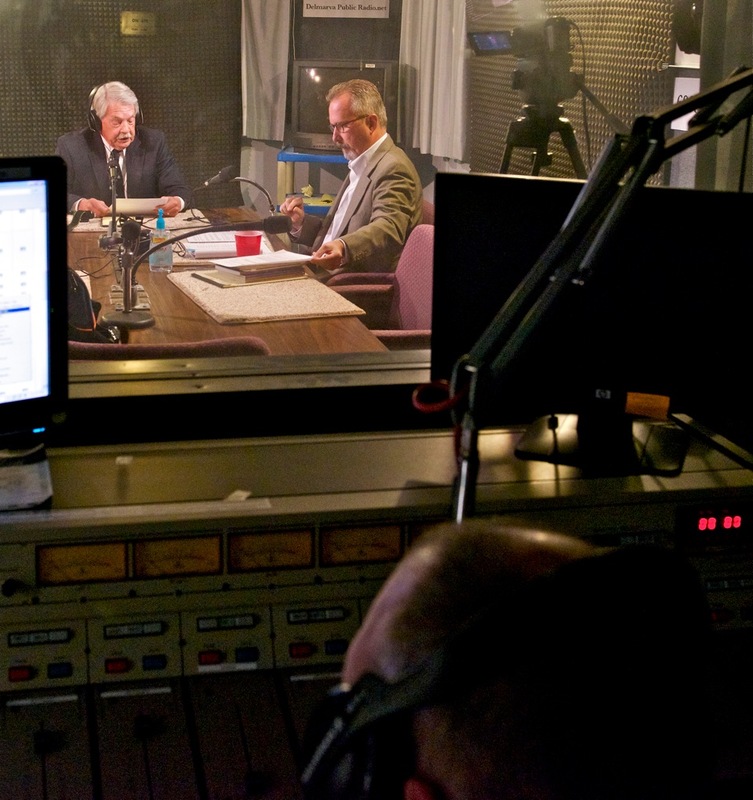 He has been a featured speaker on National Public Radio's All Things Considered, Pacifica Radio, the BBC World Service and has been a consultant to Time, Rolling Stone, and public broadcasting’s Frontline. His book, Writing War: A Guide to Telling Your Own Story serves as the curriculum for VWP seminars and workshops. A memoir, The French Lieutenant’s iPod, is forthcoming in 2014 from Schaffner Press. 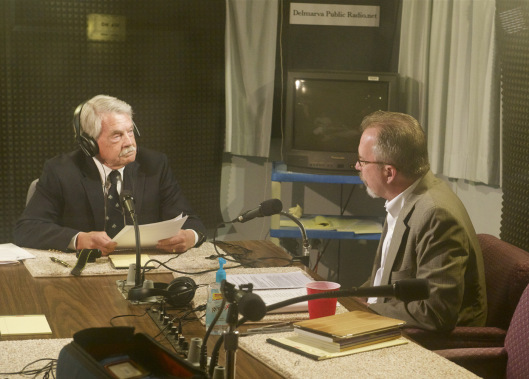 Hal Wilson, left, of the Eastern Shore Writers Association, interviews Ron Capps in Delmarva Public Radio’s studio (WSDL-FM, Salisbury) – Photographed by Wilson Wyatt. Click here to hear the interview.